Thanks to my upbringing, I learned from a very young age that one’s mindset can be a blessing or a curse, so “The Great Life Mindset” by Roy A. Piercy called my attention immediately just by its title. I found that this little book offers great advice for today’s youth as it shares life lessons on different areas relevant to the great adventure that is our current life journey. However, I believe that there is also some advice that can benefit people already in the later stages of their lives. The book has two areas of development: the Financial, and the Personal. Yet the flow of the book does not feel like he is tackling these areas separately. In fact, I was able to feel how our mindset about money will also affect our personal lives and vice-versa. 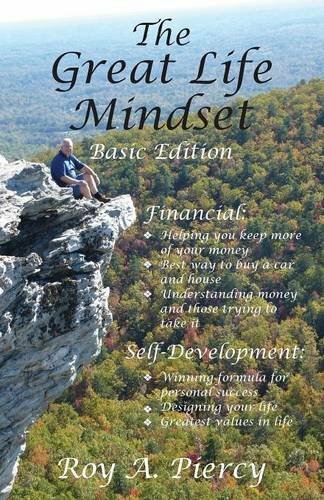 Within the 12 chapters, readers will get practical advice and information about successfully managing income, expenses, savings, and investments; they will also be enlightened on what money really should represent to them, so that their personal development and happiness goals are also reached. Based on wisdom collected from his own mistakes and life journey, Roy A. Piercy presents readers with a well-written guide to serve as a reference book to living. His voice is to the point; his writing style is easy to follow. He does not sound preachy at all, and actually feels you are getting advice from someone you know. Although this book is targeted for young people beginning their journey, I definitely believe anyone in whatever stage of life can benefit by reading what Piercy has to say. In my opinion, “The Great Life Mindset” by Roy A. Piercy is that little book we should keep to re-visit and remind us who we are and what we want from our lives. It is also a valuable guide for young adults that will help them begin their journey on the right foot. A Five-Star must read!